You iPhone is just full of great stuff! You have plenty of tools at your disposal that you can use even during a call. When you’re on a call, whether you initiated it or received it, a set of tools is displayed. Mute: Silences the phone call so that the caller can’t hear you, though you can hear the caller. 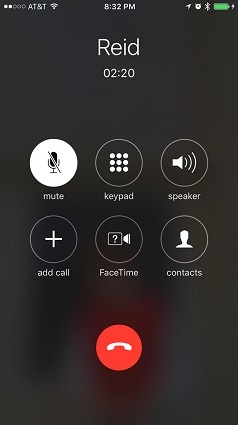 The Mute button background turns white when a call is muted. Tap again to unmute the call. Keypad: Displays the numeric keypad. Speaker: Turns the speakerphone feature on and off. If you are near a Bluetooth device and have Bluetooth turned on in your iPhone Settings, you will see a list of sources (such as a car Bluetooth connection for hands-free calls) and you can choose the one you want to use. Add Call: Displays Contacts so that you can add a caller to a conference call. FaceTime: Begins a video call with somebody who has an iPhone 4 or more recent model, iPod touch (4th generation or later), iPad 2 or third-generation or later, an iPad mini, or a Mac running macOS 10.7 or later. Contacts: Displays a list of contacts. 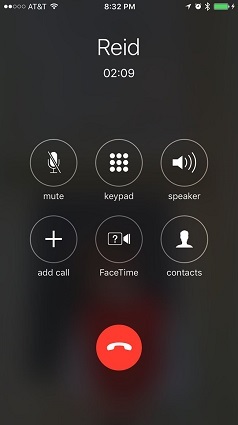 You can pair your Apple Watch with your iPhone to make and receive calls using it.